After investing time and money into building your home theater or music system, you may discover that the source of the audio you’ll be piping through your home is more important than you’d ever realized it would be. In the past, we listened to music on vinyl, resigned to the fact that one scratch would destroy an entire album’s sound quality. After vinyl came cassette tapes, which were a less-breakable form of music distribution but also led to hours spent manually rewinding the tape itself to preserve the integrity of the music it stored. Years later, CDs gained popularity, and the world rejoiced about finally being able to skip from track to track, allowing you to enjoy an album song by song, instead of in its entirety. And with the creation and widespread use of the internet, MP3s became the new norm, thereby rendering CDs obsolete (and bringing us untold computer viruses that came to us like Trojan Horses in the MP3s we downloaded from Napster and Kazaa). Today, we’ve reached an apex in music distribution. Now, we are able to have our music streamed to us online, forsaking physical delivery vehicles like the boomboxes and CD players of the past for files that exist in the cloud and can be listened to via streaming whenever we want. These days, Tidal is all the rage – but there are also a number of other music streaming services out there that are just as good, if not better. 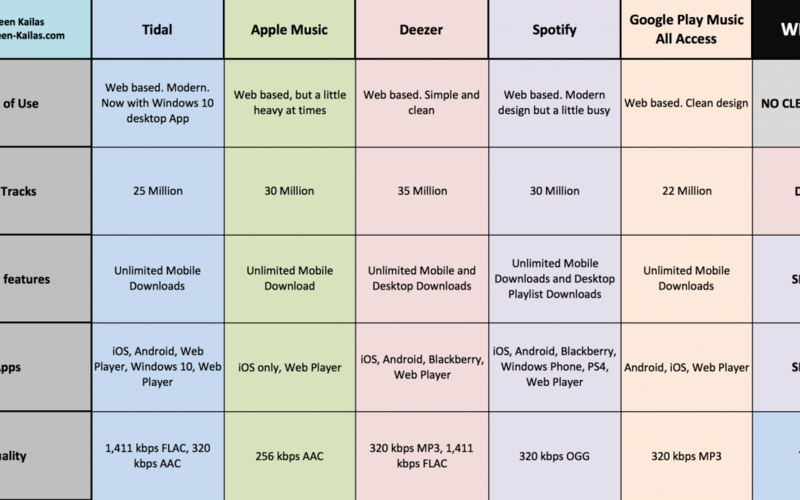 I’ll admit that before Tidal, most online music streaming services were distant versions of their original recordings, distorted and manipulated by the compression necessary to create MP3s and the subsequent compression needed to stream those MP3s online. With Tidal music, the songs are brought back to life, reaching near-CD quality sound, which Tidal refers to as “HiFi” quality – but this comes at a pretty steep price, at over $25 per month for a subscription. With that said, in my personal opinion, despite how great and easy Spotify is to use, I still choose Tidal overall because of the fact that their music sounds the most crisp, and the most real. I do have one complaint, though: Tidal’s Windows 10 app does not bit-stream audio to my receiver, which means that Windows 10 is what is doing the audio processing and outputting a digital PCM stream to my receiver. For everyone who paid good money on a quality receiver, we paid a premium for our receiver to process music and other audio at a high-quality level. If Tidal could bit stream audio on its own, and not with an intermediary program, straight to the receiver, just like the Netflix app does, then the sound quality would be much better. Until them, I’ll just keep using my iPad to Air Play Tidal’s music and continuing enjoying the “HiFi” life!